Since one of the main goals of the ESP is to provide a professional platform for further development of Pathology practice in Europe, it is only natural that the ESP closely interacts with National Societies in Europe. This has been formalized in the Advisory Board, which is composed of one representative from every National Society of pathology affiliated with ESP. The Advisory Board provides invited and uninvited advice to the Council and to ESP President. The Advisory Board meets twice a year, once during the annual congress and once in the office in Brussels. 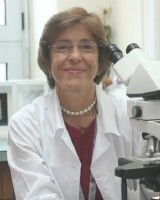 Faculty of Medicine University "Sv. Kiril i Metodij"